We've both sung since we were children. Me, at parties in my family's Crosby Road council house in Grimsby and Nunsthorpe School choir; Julie, to the old men in the sea front shelters on Cleethorpes promenade. 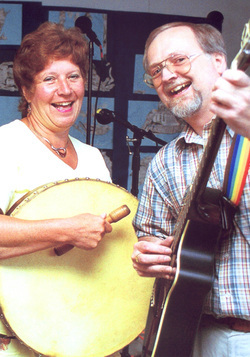 We met on a folk club night at the Royal Oak in the village of Holton-le-Clay in 1970. I was attracted to her new Yamaha classical guitar, and I think she liked my hair - yes, folks, I had hair! Our friendship developed in 1971 when we each performed at the Black Swan folk club in Grimsby, and we 'cemented our relationship' on the bus back from Bardney Folk Festival later that year (here skipping the interesting bits). We married in November 1972, and performed as a duo until 2012 when we decided to have a rest. Our influences have been too many and varied to detail. Locally we've always admired the singing and writing of John Conolly and Bill Meek, who've so ably chronicled in words and music the days when Grimsby spawned the world's foremost trawler fleet. Mirroring the working life (as a trawler fitter) of my dear departed father (John Evardson), I've followed Bill and John's example by producing several songs of my own, one or two of which have been adopted by other singers. Though we don't perform these days we continue to record, so as to put the new songs 'out there'. We've made four CDs to date, and they'e all now available for download. For details hover on Home above then click on the CD you're looking for. We're also gradually feeding our songs with pictures onto You Tube. Please follow the link shown below each applicable track.